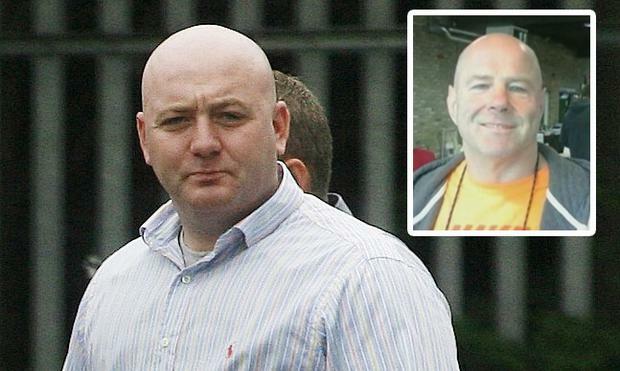 A SENIOR detective has told a trial that he identified Freddie Thompson in two clips of CCTV as the driver of a “spotter” vehicle allegedly used in the murder of David Douglas. Freddie Thompson (37) was also identified from CCTV footage at the Guild of the Little Flower on Dublin’s Meath Street one minute before Mr Douglas was shot dead. Mr Thompson, through his legal team, has accepted that this man, who gets out of a silver car and speaks to a woman at a market stall, was him. Detective Sergeant Adrian Whitelaw, from Kevin Street Garda Station, told the Special Criminal Court that he further identified Mr Thompson from CCTV footage at Little Caeser’s on Balfe Street later that night, where he met up with Mr C and Mr F, both of whom are suspects in the case. The CCTV footage shows Mr Thompson and Mr C laughing and smiling as they are shown to their table. “I know him. It’s him”, Sgt Whitelaw told the court. Mr Thompson, with an address at Loreto Road, Maryland, Dublin 8, has denied the murder of David Douglas (55), who was shot six times in his partner’s shop at Bridgefoot Street, Dublin 8 on July 1, 2016. It is the State’s case that Mr Thompson provided logistical support in the planning and execution of a murder and was the driver of one of two ‘spotter’ vehicles. In his evidence, Sgt Whitelaw said he viewed a compilation of four CCTV clips prepared by Garda Ciaran Byrne at Kevin Street station on August 12, 2016. He said that he recognised the driver of a silver Ford Fiesta, captured on CCTV from the Whiteswan Industrial Estate on the morning of the murder, as the accused. The Fiesta was one of four vehicles of interest in the investigation of Mr Douglas’s murder. Gardai have alleged that four vehicles were used - a silver Mercedes, which was the “murder vehicle”, a silver Suzuki Swift, and two ‘spotter’ cars, a blue Mitsubishi Mirage and a silver Ford Fiesta. Sgt Whitelaw said he identified Mr Thompson as the driver of the same Fiesta, taken from CCTV on Donore Avenue, later that same day. Mr Thompson was further identified by Sgt Whitelaw as the man getting out of the silver Fiesta from CCTV from the Guild of the Little Flower on Meath Street at 4.10pm that day. In that footage, Mr Thompson is bearded, and wearing a baseball cap, jeans and a black jacket. Sgt Whitelaw said he identified Mr Thompson as the man in footage from Little Caeser’s Restaurant last that night. Again, Mr Thompson is bearded, and wearing a baseball cap, jeans and a black jacket. Cross examined by defence counsel Michael O’Higgins SC, Sgt Whitelaw said was involved in the investigation into Mr Douglas murder and had attended case conferences so he was aware that Mr Thompson had been identified as a suspect. He said he had “no hesitation” in identifying Mr Thompson as the man in all four CCTV clips. “I was sure”, he told the court, adding that he had met Mr Thompson the previous April or May and he had been bearded and wearing similar clothing. Sgt Whitelaw told the court that he had seen Mr Thompson in many forms. “He can look different. He looks different today. But I am 100% satisfied that it’s him. I know him”, he said. Asked by Mr O’Higgins if it made it harder to identify an individual when their look changed, Sgt Whitelaw responded: “I’ve always been able to recognise him [Mr Thompson]”. Sgt Whitelaw accepted that he had previously seen the footage from Little Caeser’s and Guild of the Little Flower, but he denied this influenced his identification in the CCTV footage from Donore Avenue or Whiteswan Industrial Estate. “I know him”, he repeated. Mr O’Higgins will continue with his cross examination of Sgt Whitelaw in the morning. Earlier, more than 20 witnesses took to the stand, all saying that they had given gardai permission to access and download CCTV footage under their control. In cross examination, Mr O’Higgins asked each witness if the CCTV was registered with the Data Protection Commissioner. The witnesses said they were unaware or not to their knowledge. The trial continues before Mr Justice Tony Hunt, presiding, with Judge Gerard Griffin and Judge Flann Brennan.